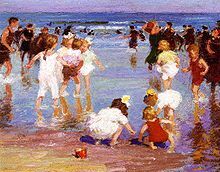 American Impressionist Edward Henry Potthast is best known for sunny beach scenes, filled with sparkling surf and high-keyed details such as balloons, hats and umbrellas. He was born to a family of artisans in Cincinnati, Ohio, on June 10, 1857. At age twelve he became a charter student at Cincinnati’s new McMicken School of Design. He studied at McMicken, off and on, for over a decade. From 1879 to 1881, his teacher was Thomas Satterwhite Noble. Noble, a portrait and figure painter, employed a dark palette and a rich, painterly technique derived from his instruction under French artist Thomas Couture. Even though he enjoyed modest success in his hometown, Potthast made the decision to leave Cincinnati in 1895 and establish himself in New York City. While he went about setting up a painting studio, he fulfilled illustration commissions for the publications Scribner’s, Century, and Harper’s. He exhibited watercolors and oil paintings in exhibitions at the Art Institute of Chicago beginning in 1896, and at the National Academy of Design from 1897. He won the academy’s Thomas B. Clarke prize for best figure painting in 1899, the same year was he was elected an associate of the academy. Potthast was made a full academician in 1906. After his move to New York, Potthast made scenes of people enjoying leisurely holidays at the beach and rocky harbor views his specialty. He spent summer months in any one of a number of seaside art colonies, including Gloucester, Rockport and Cape Cod in Massachusetts, and Ogunquit and Monhegan Island, Maine. Such was his love of the beach that, when he resided in New York, he would journey out on fair days to Coney Island or Far Rockaway with his easel, paintbox, and a few panels. 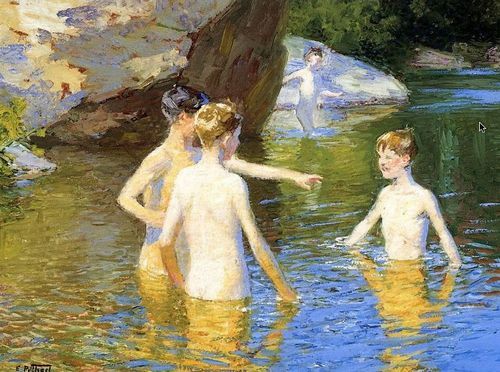 There is an exhibit of Potthast’s work called “Eternal Summer:The Art of Edward Henry Potthast” at the Cincinnati Art Museum on view now until September 8,2013. This entry was posted in art work, books, history, Manhattan, summer/beach houses, travel and tagged art work, Beach house, History, Holidays, Massachusetts, summer, travel. Bookmark the permalink.